Program #MOYB002. Recorded in Madison, WI on November 8, 2003. Journalism, the fabled Fourth Estate, was once guided by the dictum: Comfort the Afflicted and Afflict the Comfortable. Today, millionaire anchors, caked in makeup and competing for the best hair on the air are bored readers of teleprompters. As newspapers, TV and radio are gobbled up by huge conglomerates fixated on maximizing profits, investigative journalism, digging for stories, recedes into memory. 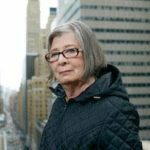 If information is key to the healthy functioning of democracy then what happens when the focus is on Scott Peterson and Martha Stewart? And when White House and Pentagon press releases are accepted as fact? A textbook case of journalism’s decline is Iraq. Reporters were a conveyor belt for administration fabrications. Many of them went a step further, they became embedded. 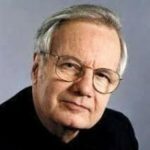 Bill Moyers is a renowned journalist and commentator. He was senior correspondent for CBS News, and producer of many of public television’s most heralded programs. He is the winner of more than 30 Emmy Awards, and the author of several bestsellers including Moyers on America. A longtime fixture on PBS, he retired as anchor of Bill Moyers Journal in 2010.